UK government documents reveal that Cedric Belfrage (above) was a top spy for Soviet Russia. Cedric Henning Belfrage (1904 - 1990) is linked to Lord Victor Rothschild, who was a top man in MI5 and MI6. Belfrage was born in Britain but became an American citizen. Belfrage was a Cambridge dropout, fixer for the movie mogul Samuel Goldwyn, film critic, journalist and spy. After the fall of Nazi Germany, Belfrage became a "press control officer" in the American "Psychological Warfare Division" and was sent by the Americans to Germany. Belfrage had access to the top secrets. Belfrage is seen as being as important as the other Cambridge spies, whose leader was reportedly Lord Victor Rothschild and whose members included Kim Philby, Donald Maclean, Anthony Blunt and Guy Burgess. 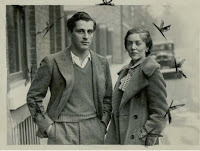 Guy Burgess claimed to be the illegitimate son of Lady Rothschild. From 1942 until 1944, Belfrage was employed by MI6 as the right-hand man of William Stephenson, who was the most senior British intelligence officer in the western hemisphere. One of Belfrage's colleagues, when working with Stephenson was Isaiah Berlin, a friend of Lord Victor Rothschild. Cedric Belfrage - Spartacus Educational. 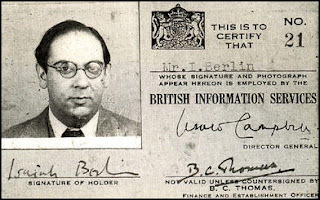 Isaiah Berlin "acted as a spy and emissary for Chaim Weizmann, later first president of Israel"
To the Soviets, Belfrage was more important than Kim Philby. In 1945, Belfrage's Soviet handler was Elizabeth Bentley. In 1945, Elizabeth Bentley defected to the USA. Belfrage was interviewed by the FBI. Belfrage told the FBI that, on the instructions of MI6, he had given the Soviets certain material, but, that it was useless bait, intended to trick the Russians. Apparently, MI6 then gave Belfrage their support. Belfrage was not prosecuted, but he was deported from the USA. Belfrage was married five times. Belfrage died in Cuernavaca, Mexico in 1990. 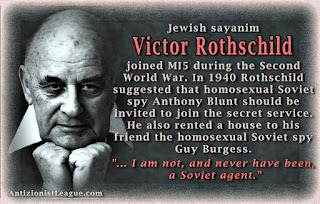 I'd say that it is true that Victor R. was not a Soviet agent: the Soviet Union worked for him. Your elucidation of the English speaking brain trust, fits with my imaginings of what my class enemies personal moral swamp would consist of. I naturally have abhorred the sleaze these scum represent. Looking back at a clean life is glorious. Israel Bombs Syria. Is This A Prelude towards a Full Scale War? Israel. Israel. Israel. Anything to cause mayhem and death. All the while pushing your own agenda. Israel was spinning " blame Iran" for the rockets their Islamic buddies surely fired into occupied Syria, while striking nothing. Karl Heinrich Marx (5 May 1818 – 14 March 1883), was a 19th century Jewish political ideologue who presented himself to the world as a journalist and economist. He is best known for infiltrating the nascent movement of Socialism, likely as an agent of his cousin Rothschild; and on the supervision of his mentor Moses Hess, creating a supposedly "scientific" theory known as Marxism. After his death, his supporters adapted his theories in numerous ways, including Vladimir Lenin who created Bolshevism which was enforced on Russia in 1917 with the October Revolution. Marx came from a long line of Jewish rabbis. He lived in Dean Street, London and squalor. He used to visit the Red Lion pub at Great Windmill Street, Soho where he and Friedrich Engels were asked to write what became the Communist Manifesto. His best known work is the book Das Kapital, which fails to mention that money is printed out of thin air and keeps the name of his cousins, the Rothschilds, out of it, despite the fact that they were the richest and most powerful capitalist family in the whole world. As an internationalist, Marx saw free trade (Judeo-Masonic British Empire policy) as positive because it undermines established nations and cultures; he was strongly opposed to protectionism. Moses Hess, the 'Red Rabbi', converted both Marx and Engels to Communism, and originated the expression "religion is the opium of the people", which was used in the Communist Manifesto (1848). His essay On the Essence of Money identified Judaism with the cult of money, and asserted the dominant role of Jews in world finance, providing Marx with the information he used in his On the Jewish Ouestion. But 20 years later, Hess rejected assimilation and returned to Judaism, pronouncing the Jews a race and a nation, and calling for a Jewish socialist state, in his book Rome and Jerusalem (1862). In 1867 Hess, by now a Zionist, joined the (Communist) International Working Men's Association, siding with Marx in his disputes with Bakunin. On the surface Zionism is a Jewish ‘nationalist’ movement created during the 1800´s. It aimed to establish a Jewish homeland in the Middle East. This cause found its realization in the creation of the state of Israel in 1948 after the end of British rule, realizing the promises of the Balfour declaration. However, this is only what the gentile is meant to see. Ideological ‘Zionism’ is a much more wily and illusive entity. The origins of the term Zionism appeared in the early 1800’s and the work of one Moses Hess. Though Hess was never actually to use the word it was coined by Nathan Birnbaum in 1890, with the book Rome and Jerusalem Published in 1862 Hess laid the foundation of what is considered as the philosophical base of Zionism. Hess is described as a “Jewish socialist’” and worked closely with his student the Jew Karl Marx who barely 14 years before published The Communist Manifesto (1848). Following this a wave of revolutions broke out in Europe. Marx was a member of the Communist League an organization of émigré workers out of Germany with its centre in London of which Marx had became the major theoretician. It wasn’t until 1896 that Theodor Herzl published the book Judenstaat (The Jewish State) that argued for the creation of a Jewish state motivating Jewish Zionists to emigrate or make Aliyah (rise up) to Israel. Darkly ironic considering how the State of Israel, a land no bigger than Wales, did ‘rise up’ through lies and stealth to rule the world. The father Adolphe (Ralph) Miliband was a Marxist academic born in Brussels on 7th January, 1924. In 1939, aged 15, he became a member of internationalist Marxist –Zionist group Hashomer Hatzair the same group that Jewish terrorist Abba Kovner, at the time 21 years of age, was an active member and leader of. These young Marxists idolised Bolshevism forced upon Russia post 1917. In fact it was on orders from Hashomer Hatzair that terrorist Kovner and his faction Nakam planned the genocide of 6 million Europeans post WWII. Kovner was arrested aboard a British destroyer with enough poison to murder the inhabitants of four major European cities through their water supplies. Bizarrely after only a year in custody the genocidal terrorist Kovner was quietly released into Jewish Israeli hands. It is critical to note that the Jew Victor Rothschild had a leading role in the British security services (MI5) at this time.